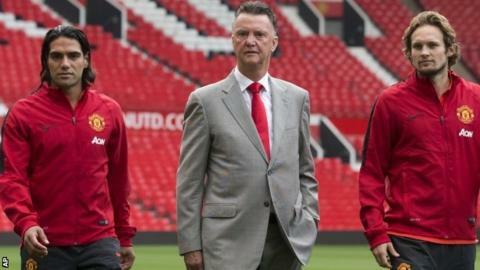 Louis van Gaal believes a top three Premier League finish is a realistic aim for Manchester United. Battling a lengthy injury list now containing Phil Jones, who is a doubt for England's Euro 2016 qualifiers next month, United have struggled so far. Yet Van Gaal has no problem with the expectations laid out to investors by executive vice-chairman Ed Woodward this week. "I don't think it is an unreasonable target," said the Dutchman. "A club like Manchester United has to put targets. I also put targets. "But the top three, it is logical because Manchester United wants to be in the Champions League." With just two points and two goals from their opening three Premier League games, in addition to a shock Capital One Cup exit at League One MK Dons, United will be seeking a first win of the season in Sunday's Old Trafford encounter with Queens Park Rangers. Summer arrivals Radamel Falcao, Marcos Rojo, Daley Blind and Luke Shaw could all make their debuts, with British record £59.7m signing Angel di Maria set for his home bow. However, there are nine players unavailable for this weekend's game, including Jones who picked up a hamstring injury on England duty in Switzerland on Monday. And the 22-year-old is now a doubt for the matches against San Marino at Wembley on 9 October and in Estonia three days later. "Jones is maybe three weeks to a month," said Van Gaal. The United boss knows that with over £150m spent this summer and the table to climb, results have to improve, no matter what the injury situation. "We have done very well in the transfer period," he said. "In spite of us not playing in the Champions League, players are coming to Manchester United. "That is a big plus. But we also have to produce the results - and we have to start on Sunday against Queens Park Rangers."